After receiving threats and many houses being demolished by a local militia, Tawergha displaced people desperately pack their belongings to leave the Triq al Matar settlement in Libya. 10 August 2018. 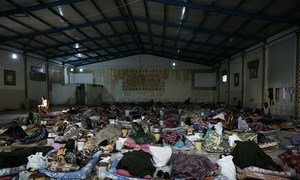 Libyan militias have forced nearly 2,000 people from an ethnic minority likely targeted for their alleged links to the former Gadaffi Government, to flee long-established shelters in the capital Tripoli, the UN Refugee Agency, UNHCR, said on Tuesday. In an appeal for the human rights of families originally from the city of Tawergha to be respected, UNHCR spokesperson William Spindler, said that the exodus happened last week, following attacks by unidentified assailants. Until the attacks, Triq Al Matar was the largest settlement for internally displaced people in Tripoli and home to around 370 families. They were originally from the northern city of Tawergha, but fled their homes in 2011, after the battle for nearby Misrata ended, seeking refuge in informal settlements around Tripoli or Benghazi. After their recent targeting in the Libyan capital, victims sought shelter with relatives or in other settlements for displaced people, according to UNHCR. Families with cars “are now sleeping in them”, said Mr. Spindler, noting that the 40,000-strong displaced minority from Tawergha are waiting to return home “following an agreement by the parties involved” in the crisis-wracked country. A house in Triq al Matar settlement in Libya demolished by a local militia to force Tawergha community to leave the area. 10 August 2018. The development comes amid ongoing factional conflict in oil-rich Libya, widespread instability and a humanitarian and economic crisis, despite the international community’s efforts to provide a platform for reconciliation agreements between warring parties. In Libya, some 192,000 displaced people have been living in dire conditions for years, according to UNHCR. The agency is calling for urgent solutions to end their suffering and allow them to return home in a voluntary, safe and dignified manner. The United Nations Secretary-General, António Guterres, has called for more accountability for human traffickers in Libya, after the UN Security Council on Thursday added six individuals accused of leading smuggling and trafficking networks in the country, to its Sanctions List.